For the second time in 12 months Roscommon came to Castlebar in the FBD League and went home with a place in the final after beating Mayo on their own patch. How this season will be judged will be seen in the months that come on much sunnier days, but in this encounter the hungrier and more in tune visitors were deserved victors. Mayo had two changes to the side that was named in the programme with both Kevin McLoughlin and Andrew Farrell having to cry off injured, with Diarmuid O’Connor and Brian Reape coming into the match day 23 and Donal Vaughan and Darren McHale making the step up from the bench for the start to start the game. Things went from bad to worse for Mayo on the field with both first Keith Higgins (knee ) and then Kevin Keane (shoulder ) having to leave the action inside the first 20 minutes. After the game Mayo manager Stephen Rochford said that he would be waiting for scan results on both men in the coming week to see how they are. The injuries to both men and then with Conor Loftus who had been a very bright spark in an otherwise grey attack for Mayo also having to come off injured with five minutes to go, sees Mayo injury list grow as they head into the start of the National Football League in a fortnights time against Cork, with Dublin then coming to town six days later in what will be a very serious test of their credentials in February. Roscommon made a number of changes to their starting 15 from the one that was announced themselves before throw in with the trio of Ronan Stack, Seanie McDermott and Cathal Cregg coming into the side for Sean Mullolly, Sean Purcell and Cathal Shine respectively. But those changes didn’t stop them getting into their stride early on and going into a 0-4 to 0-0 lead after 13 minutes with Diarmuid Murtagh, Neill Collins, Fintan Cregg and Cathal Cregg all raising the white flag. Mayo by that stage had lost Higgins to injury and played about five minutes with Tom Parsons receiving treatment on the sideline for a thumb injury. It took Mayo 16 minutes to register their first score and that came from a free from Conor Loftus after Vaughan was fouled. That score was Mayo’s first shot at the target up to that stage, with the Roscommon defence handling everything Mayo asked up them off to that juncture. Mark Ronaldson swept one over the bar from the MacHale Road side nine minutes before the break to cut the gap back to two and fine score from Keith Ruttledge left just one between the sides with eight minutes left in the half. That Mayo purple patch didn’t last two long and Roscommon reeled off the next two points from the boot of Cathal Cregg, his second score in this run was a real top drawer effort, shooting with the outside of his right boot under pressure from a tight angle. Mayo did have the last say on the half when Loftus scored his second point from a free in injury time to send Mayo in trailing by two points at the break. Mayo stayed in the dressing room a good five minutes more that Roscommon at the turn-around, but it was a case of more of the same early on in the second half with Ciaran Murtagh and Enda Smith scoring the first two points of the half from back to back plays. After Murtagh’s free had gone over the bar, Smith won the break from the resulting kick out and burst at goal. He played a quick one-two with Fintan Cregg on route before he slammed the ball over the bar to put his side into a four point lead. 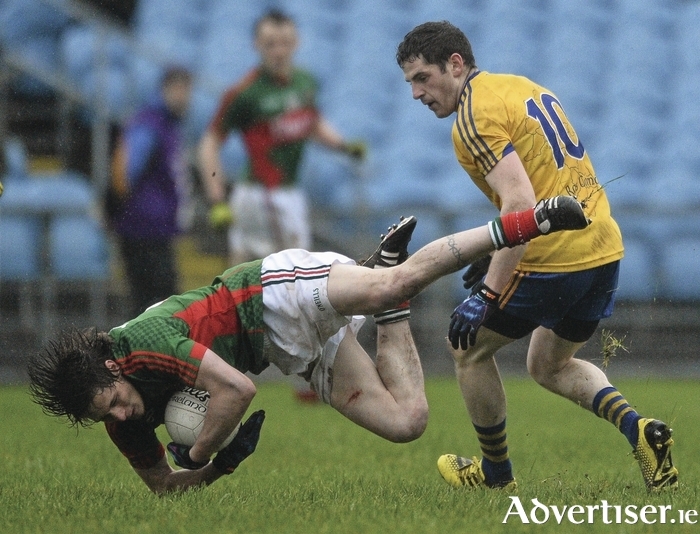 Mayo did hit back with their own double salvo from another Loftus free and a Jason Gibbons effort after a barrelling run, but that burst was stopped by a Diarmuid Murtagh free to keep Roscommon always that bit ahead of their hosts. Loftus cut the gap back to two points with another pointed placed ball 42 minutes in, but over the next six minutes Kevin McStay’s side kicked three points on the bounce to leave the score at 0-12 to 0-7 in favour of the guests. Loftus kicked one great point from out on the stand side to cut the gap to four, before Ciaran Murtagh kicked his sides final point of the game eight minutes from time to keep five between the sides. Mayo did manage to close the gap to three before the final whistle thanks to a brace of pointed frees from Jason Doherty after Loftus had left the action and they did create one half-goal chance, but Roscommon held on for a deserved victory. For Mayo the attention now turns to Pairc Ui Rinn in two weeks time and the league opener against Cork, with the injury list continuing to pile up, maybe it’s better for them to have a weekend off next week and try and get the walking wounded patched up as best they can for the start of the next campgain. Mayo: R Hennelly; G Cafferkey, K Keane, P O’Hora; K Higgins, C Crowe, C Boyle; T Parsons, J Gibbons; D Vaughan, M Ronaldson, D McHale; K Ruttledge, J Doherty, C Loftus. Subs: L Keegan for K Higgins, S McHale for K Keane, D O’Connor for K Ruttledge, S Nally for C Boyle, B Harrison for P O’Hora, B Reape for C Loftus.